1st Annual Mendocino Whale Festival Porta Potty Decorating Contest! **Update** Fort Bragg sponsorships have sold! We still have 9 sponsorships for Mendocino. Inspired by the Alaska Run for Women, we’re excited to announce a fun and exciting new sponsorship opportunity. For just $150, your business can sponsor and decorate one of 12 portapotties: 10 in Mendocino and 2 in Fort Bragg. Your business "can" help others to "do their business"! Be the first in line to make going to the “loo” an artistic adventure to support a worthy cause! Decorated Porta Potties will be photographed and publicized on social media, and on the Whale Festival website all year long. Judging will take place after the Fort Bragg Whale Festival, March 16. Winners will be announced on Monday, March 18. Porta Potties must be undecorated by 5:00 p.m., March 2 for Mendocino and 5:00 p.m., March 16 for Fort Bragg. 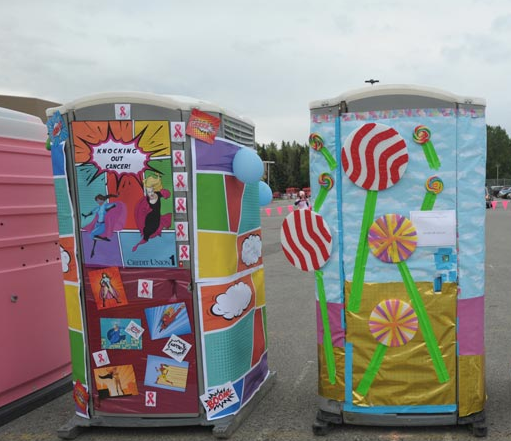 Timelines: Potties will be ready to decorate by 9:00 a.m. on March 2 and March 16. Décor must be completed by 10:00 a.m., as the events start at 11:00 a.m.
"Seats" are "going" fast so reserve your potty now! Call us at 961-6300 or email us at chamber@mcn.org.